There’s a scene in the 1947 classic holiday film Miracle on 34th Street in which a frustrated parent, unable to find a toy that’s on her child’s Christmas wish list, is astonished when Kris Kringle, Macy’s Santa Claus, recommends the parent visit a competitor’s store where the item is offered for less. Kringle almost loses his job over the suggestion, but just in the nick of time a wily store manager realizes the marketing possibilities. Soon every employee is instructed to offer similar advice. Before long, the competition is doing the same. Customers are delighted. Profits soar. These days, the notion of anything being delightful about shopping at a department store seems almost as fanciful as the notion of Santa Claus himself. Instead of stately multi-storied buildings staffed by knowledgeable, friendly people who seem genuinely glad to help, we have cavernous warehouses filled with employees who look as if having a root canal would be preferable to contending with a customer—not that they could afford such an operation on what they’re paid. For the most part, while America’s department store chains have fought to slash prices and outfox the competition, in all their maneuvering and strategizing they have also lost all sense of dignity. For the most part. Until recently I might not have hedged with such a statement, but there is a store that is an exception to this trend. It stands on the corner of Main and Davis Streets in Greenfield. On a recent visit to Wilson’s Department Store, while poking around in the toy section, I overheard a discussion between an elderly gentleman and the teenager behind the counter. After they’d searched the well-stocked shelves for a particular item without success, she did something I’d only ever seen done in the movies. “I’m pretty sure they’ve got what you’re looking for at Faces in Northampton,” she said. This May, Wilson’s Department Store in downtown Greenfield will have been in business for 130 years. Still in its original location, the store has grown considerably since its early days, stretching out into neighboring buildings and expanding into four floors teeming with handsomely presented merchandise. From the well dressed and regularly updated display windows out front to the stylishly adorned mannequins in the women’s clothing department, there’s a sense of care and artistry at work in how the store presents itself. Unlike the prefabricated, cookie-cutter glitz of the displays you’ll find at a chain store near you, each department has its own personality—not that of some slick marketing director working in an office building a thousand miles away, but of the lady or gentleman working quietly as customers browse. While this market-speak may have become cliché elsewhere, the longer you linger at Wilson’s, the more tangible this philosophy becomes. 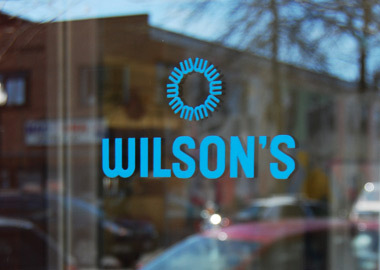 Beside one of the entrances at the heart of the store, there are two plaques commemorating the length of service many employees have given Wilson’s. There are dozens of names engraved on the one for 10-20 years of service, but even more startling are the number of names of people who have reached the “Diamond Plateau,” having worked there as long as 50 years in some cases. It’s concrete evidence that something special—if not unique—is at work here. “I’m one of those people who worked here during my college years, summers and weekends,” she said. “When I graduated, they offered me a full-time position.” She first worked in the cosmetics and candy departments, and then one summer was transferred to the business office and learned to be the switchboard operator. After years of working in advertising—a job she’d had no experience in, but Wilson’s management trained her—she became the company’s first female vice president. For Wilson’s, being family-run is more than a question of managerial lineage. It’s tempting to compare a visit to the store to a trip in a time machine, but while the approach to business and customer satisfaction at Wilson’s may be old-school, the inventory is current. This commitment to quality merchandise has attracted shoppers from far further afield than Franklin County. A customer from California regularly calls looking for sheets. Someone in Colorado has family in the Greenfield area and does all her birthday and holiday shopping through Wilson’s shopping service. Another person who grew up in the area but then moved to England calls twice a year to order towels and other items. Still, while Wilson’s is known far and wide, Beauregard credits local shoppers chiefly for the store’s longevity. Wilson’s commitment to Greenfield and the community has been repaid for generations, and the store has become an integral part of Franklin County life.